Needless to say, I wasn’t the first invite to a roaring weekend party, nor did I want to go. You could even say I felt invisible. Fast forward to present day, and this is exactly how many business blogs feel—invisible to the world. Yet they publish post after post, hoping the next one will be that special piece that gets the shares and makes them a part of the popular in-crowd. If you feel unpopular like this, it’s possible your business blog has one of the three characteristics below. If so, the good news is they are fixable. Let’s dive in. This is not what you want your readers to look like when reading your blog. The most unpopular business blogs love creating and publishing 500-word articles because marketing teams can whip up a few in no time and quickly fulfill their weekly blog quota. But pieces like these are not interesting nor do they solve your readers’ problems. Your potential customers and prospects are coming to your blog for answers and solutions. Could you teach a client how to get more blog traffic or write a high-converting newsletter in 500 words? I highly doubt it. This piece could barely include a general overview and not have enough room to provide detailed actionable advice. Are 500-word articles all bad? No. It’s not the word count that is the problem. If you are honing in on a specific topic like “How to Keep Your Purple Waffle Plant From Dying in The Dry Winter Months,” 500 words should be enough to satisfy this topic and give people advice they can use to succeed with their waffle plants. Your readers want ACTIONABLE advice that will help them succeed. They don’t just want to be lectured to. They already know they have a problem; they are looking for real answers. They want advice they can immediately apply to their lives. Answer their burning questions, and give them the keys to change their lives and your content will be popular. The caveat? This type of content is difficult to write in 500 words. Even Google agrees with me. According to a Backlinko study, the average Google first page result contains 1,890 words. If you still don’t believe me, try it for yourself. Type any term in Google and click on a few of the search results that include blog content. How many words does each blog post contain? 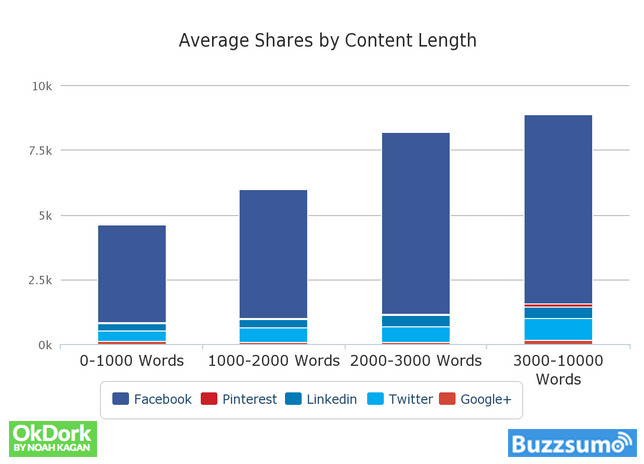 Buzzsumo found that the longer the content, the more shares it gets. Posts containing 3,000 – 10,000 words received the most shares (8859 total shares on average). Okay, so maybe you are thinking of creating some long-form content. Before you do though, you should know that word count is not what makes a long-form blog popular. You can’t just add more random words to a blog to make it better. Popular long-form content provides lots of actionable advice. This is one of the secret sauces to their success. What does it mean to provide actionable advice? Here’s an example. I could have ended this section right here. I gave you a nice introduction so you can understand why long-form content may be the key to helping your blog gain some popularity. But, is that enough for you to take action with? Maybe, but not entirely. Sumo – Sumo publishes monster-sized case studies that take a deep dive into successful brands and reveal proven strategies, methods, and tools. Buffer – Buffer pieces get hundreds of shares. It publishes in-depth posts on social media, development, customer stories and insider stories about their business and how it runs. Foundr – Foundr blog content is long-form and super actionable. Each post includes advice and examples you can apply to your life immediately. Visit these blogs and read through some of their posts to get a feel for what popular blog content looks like. Is it boring? C’mon, you can be honest. If so, focus your topics more and build out longer-form content. For example, if you published a 500-word blog post on “How to Create An Effective Content Marketing Strategy For Your Business” (P.S. that’s a boring headline), take one of the sub-topics mentioned in that piece and create a focused piece on just that sub-topic. This will allow you to dive deeper into the topic and provide lots of examples and takeaways. If your headline stinks, no one will read your post—even if it is super actionable. Effective headline writing would take an ebook to explain so below I linked to some of my favorite content on the topic. If your company’s marketing budget is fixed, instead of publishing three to four 500-word posts a week, create two long-form pieces at 1,000-2,000+ words each. And make sure to work with writers who know their stuff (See section 3 below). You know that shame you feel when you down a box of donuts after working out? You also know how that shame instantly vanishes when your friend tells you she just did the same thing? That’s what we call empathy. We feel connected to people when we share similarities, and empathy helps us process pain and become better people. Your blog content NEEDS to evoke this type of emotion from your reader. You can do this by getting more transparent and identifying more with your humanity (mistakes and all). NOTE: You don’t have to act like the smartest, most popular all-knowing guru to get more blog popularity. In fact, this can come off as pretentious, and in the world of business blogging, it’s better to take off your mask and reveal what is going on behind the scenes. Now I’m not suggesting you reveal all of your deepest, darkest secrets and epic failures, but how about showing a little transparency? There is a way to remain professional while still showing a little humanity to allow people to get emotionally connected to your content. Yikes! Yup, I said “failure.” I understand that you need to show yourself as the expert and I am not suggesting you share something that would cripple your business. But, maybe you launched a marketing campaign where you enjoyed some wins—and suffered some losses. Share both! Your readers will connect with your transparency and learn so much more if you share why you failed and how you fixed the problem. In the last section, I shared Buffer blog content as an example of actionable long-form content. 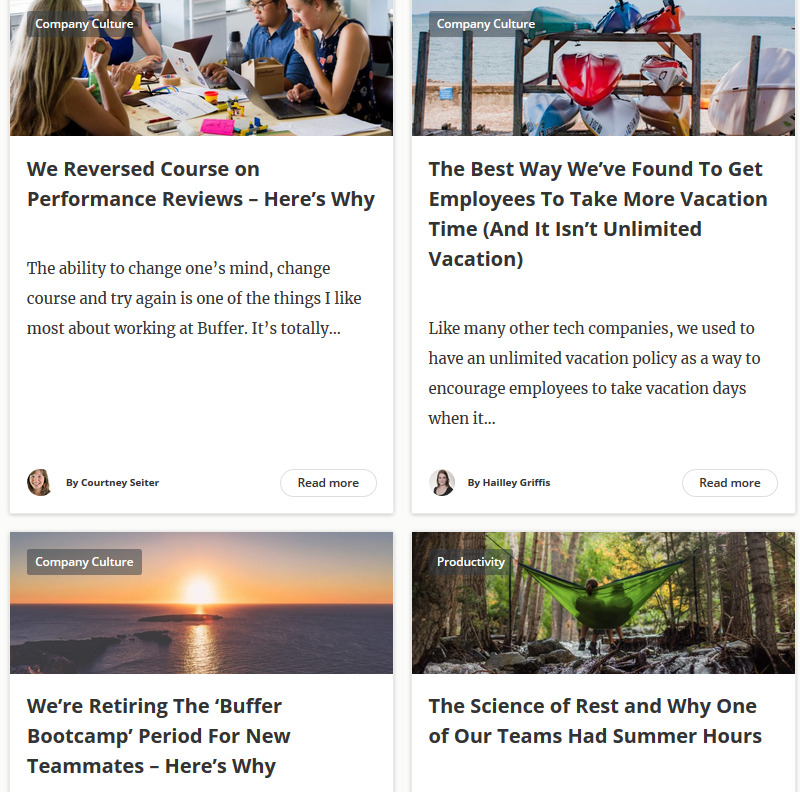 But Buffer also publishes raw transparent stories that highlights the inside workings of their business and the strategies they tried that worked (and those that didn’t). It’s okay to be a little colloquial (conversational) with your blogs. When blog content is too stuffy and corporate-sounding, it comes across as dry and boring. Unless your business calls for content with a more professional tone (law, medicine, etc. ), don’t be afraid to get a little more informal with your blog content. Your audience will enjoy reading it as a result. Telling stories endears people to your content because it fosters a connection. When you can get a reader to say, “Yes, that’s me too!” you will have an instant fan. 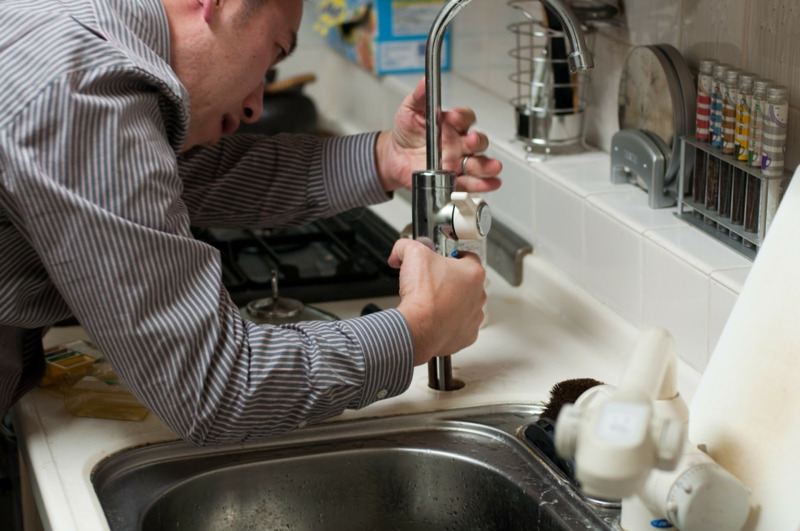 If the water pipes in your home suddenly burst, what type of person would you hire to fix the problem? Would you search through the yellow pages (I’m aging myself) and hire someone who doesn’t have any practical experience as a plumber, but has watched 20 YouTube videos on how to fix pipes? I think not. So, why would you hire a writer who does not have practical, hands-on expertise in your niche? Experience-based content that hails from a subject matter expert is some of the most powerful content on the web. (Tip: don’t say dramatic things like that in your content unless you can back it up with stats. I’m letting this one slide). You can tell the difference between an imposter who composed 1,000 words of content from digging into internet research and an expert who knows industry jargon and can provide real-life advice and experience. The expert will connect more with your audience and teach them unique principles that are not already plastered all over the web. Disclaimer: A specialist will cost you a little more than a generalist writer, but if you want to escape the doldrums of unpopularity, this is the only way to go. If your content budget is fixed, consider spending a little more on a writer who specializes in your industry and write less content, but of a higher quality. It may seem counterintuitive, but consider that the 500-word posts written by your jack-of-all-trades writers aren’t getting any traction, nor are they helping your cause. You are essentially wasting money on these posts. Take that money and publish fewer articles of a higher quality, written by specialists. How do you find specialist writers? Finding generalist writers is easy. They are everywhere. But, it’s not as easy to find specialists. Thankfully, there are solutions that can do all of the heavy lifting for you. One of these is nDash, a platform full of specialist writers who know their stuff and are waiting to work with leading brands. I love the nDash platform because it only accepts writers who possess subject matter expertise, people who know your audience and industry intimately. When using other platforms you have to wade through thousands of generalists (some aren’t even real writers) before you can find that one diamond in the rough (if you ever do). The other benefit to using a platform like nDash is you can use it either for one-off assignments or to completely scale your entire content creation—and do so on any type of budget. As the decision-maker for your organization, this will be invaluable to you because you can find solutions within your budget and keep your blog content quality super high. You can also manage the writers, handle payments, manage workflow and other key activities directly inside the platform interface. This will help you streamline and organize your blogging initiatives. Have an in-house writer already? Great! A professional contract writer can augment their skillsets and provide different perspectives. It’s not uncommon for popular business blogs to work with multiple writers, some on staff and some contracted. Each brings their own level of experiences and expertise to the table which enhances your blog content and makes it more interesting. Do you have any of these three characteristics of unpopular blogs? Let’s review them again. If any of these apply to you, have no fear. They are fixable. Re-read my tips above and spend time on popular blogs to get a feel for what high-performing content looks like. Keep at it and before you know it, you will be the popular blog on the block. Have any questions about blog content? Hiring great bloggers? What constitutes epic content? I’m here to help. Fire away! Editor’s note: This post was written by nDash community member, Jenna Scaglione. Jenna is the marketing and blogging expert behind Lady Content, a professional blogging service for busy entrepreneurs and small to mid-sized businesses. From managing multi-million dollar product launches to blogging for startups and entrepreneurs, Jenna loves to help her clients build their businesses and get measurable results from their blogging and content marketing initiatives. To learn more about Jenna, or to have her write for your brand, check out her nDash profile page.